For those of us who haven’t experienced it, war is nearly impossible to fathom: the horror, terror, inhumanity and chaos of it. Filmmakers have been trying to make sense of it for audiences since film began. Peter Jackson may bring us as close to comprehension as any director has, not by dramatizing war or by reenacting it, but by revisiting it. 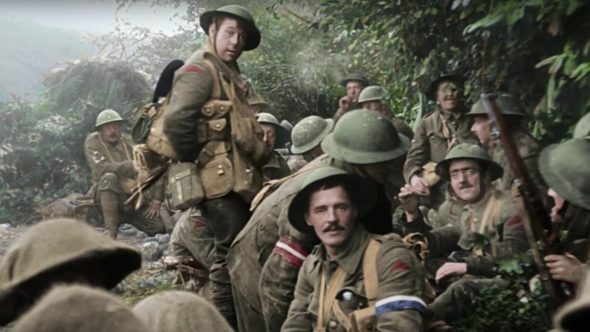 The Oscar winning director and noted World War I fanatic sifted through hundreds of hours of decomposing footage, restoring the material with a craftsmanship and integrity almost as unfathomable as war. He then recreated sound and audio, employing lip readers and researchers to guarantee the quality was a match for the beautiful restoration. Over this he layered audio, pieces from BBC interviews with WWI veterans conducted in the 1960s and 70s—candid, moving and oh so British. These he braids together into a cohesive whole, taking us from the wide-eyed patriotism that drew teenagers to volunteer, through their training and then—with a Wizard of Oz-esque moment of color, depth and clarity—into battle. At about the 10-minute mark of They Shall Not Grow Old, the obsessive maestro differentiates this film from any war doc you’ve ever seen. Quite unlike the disastrous 48 frame per second gimmick Jackson employed for The Hobbit, the restoration, colorization and even 3D here all serve a singular purpose: to immerse you in these moments, these lives, these battles. The fact that this immersion pulls you 100 years into the past is beyond impressive, but the real achievement is in the intimacy and human connection it engenders. The clarity of the faces, the tremor in the voices, the camaraderie and filth and death—all of it vivid as life. It’s as informative as it is enthralling, an equally amazing achievement in filmmaking and in education. Watching Jackson’s Tolkien films betrays the filmmaker’s perfectionism, vision and—perhaps above all—deep respect and love of the source material. The same shines through the images of these young men. And though, as the storyteller here, his respect borders on awe, he never for a moment stoops to sentimentality or emotional manipulation. He is not trying to make you feel something. He is trying to tell a lost story, and one that has no business being lost.